I found this mushroom kit at, of all places, Home Depot! It’s certified USDA organic. You grow it right in the box. Since I’m not sure I’m ready to eat quite that many mushrooms right now, I’m holding off on starting it for a month or so. The other thing that gives me pause are the directions. 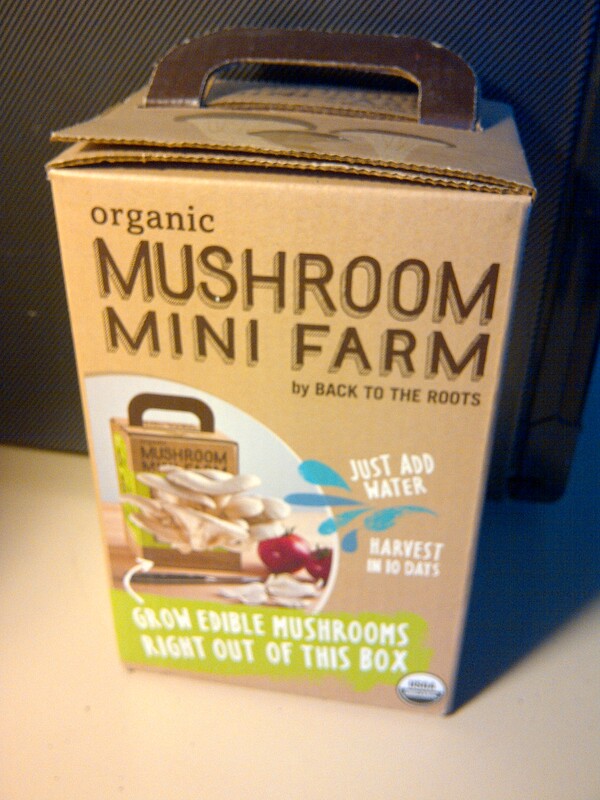 Cut open the box, water, and in 10 days you’ll have mushrooms. Really? What about light? I thought mushrooms needed dark to grow. And what about my icebox of a house? Will that affect it? Clearly I need to do a little more research before I try this at home. So while I was thrilled to find this smaller kit, I still want to research growing–and start it closer to the time when I might stand a chance of using what I grow! Why was I in Home Depot? In addition to being loyal to a place where I worked, I was looking for organic soil (yes, the do sell such a thing–usually). In this instance, they didn’t have any but it’s okay. My local garden center re-opened recently. I never need an excuse to visit a garden center! Oh, great to know–thank you!